Rihanna is always such a risk taker when it comes to fashion. Last night she stepped out in lots of cameo — a choice not many can pull off successfully. She donned her $4,418.00 VETEMENTS Shearling Transformer Coat, a Fall 2016 Alexander Wang Black Top and a pair of Nikki Orange Camouflage Cargo Pants from Plugged NYC. These were given to her by our good friend and creative director Farren “Fucci”. You can cop a pair below! 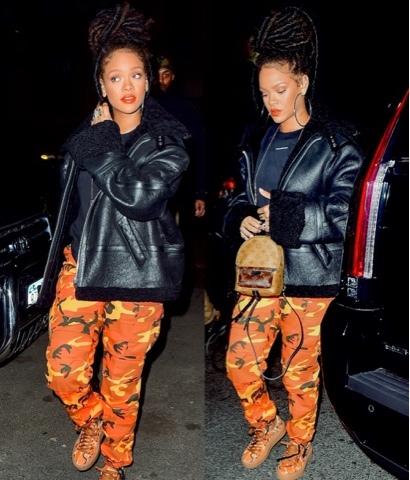 She paired her camo pants with her very own FENTY x PUMA $140.00 Camo Creeper. Rihanna’s been carrying her Louis Vuitton collaborative Frank Gehry Twisted Box Bag for quite some time now but last night, she traded up for a $2,250.00 Louis Vuitton Palm Springs Mini Backpack. The cutest part about this bag is not only is it a backpack but thanks to the added straps it can be turned into a cross body!